Billions of dollars and untold hours of research and development go into producing the next must-have products – be it the latest iPhone or a disease-fighting drug. 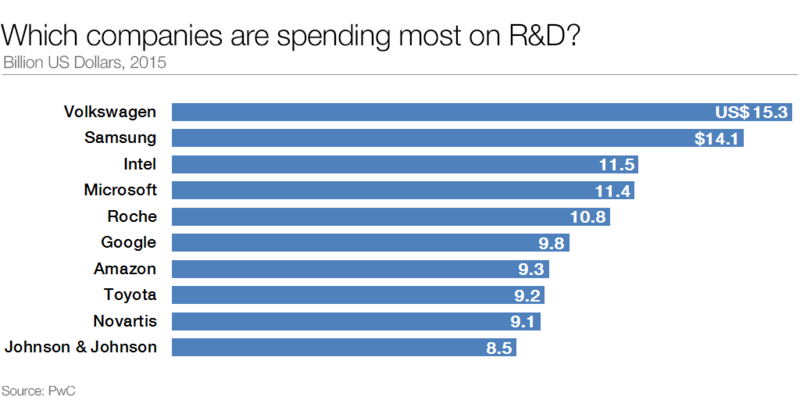 A report by professional services firm PriceWaterhouseCoopers charts the 20 publicly traded companies worldwide that spent the most on R&D in each of the years from 2005 to 2015. Perhaps unsurprisingly, motor manufacturers, tech firms and pharmaceutical companies continued to dominate PWC’s Global Innovation 1,000 top R&D spenders list for 2015. German motor manufacturer Volkswagen was in pole position in PWC’s worldwide listing for 2015, spending a whopping $15.3 billion on research projects – this works out at almost 6% of the company's annual revenue of $269.1 billion. Meanwhile, AstraZeneca, a British-Swedish multinational pharmaceutical and bio-pharmaceutical company, pumped 21.5% of its annual revenue into R&D in 2015 – the highest proportion of ring-fenced investment of any of the top 20. Other famous big spenders R&D list for 2015 included Ford, Apple, Google and Amazon. Unlike most business terms, it’s not too hard to work out what R&D is all about – it essentially refers to the investigative work a company conducts to improve what it does. This relates to either enhancing existing products and procedures, or it may lead to the development of new endeavours. Without significant R&D investment, many high-tech and scientifically-advanced products that benefit millions of consumers would not exist today, or continue to evolve. The first iPhone was unveiled in 2007, and a decade later, Apple’s soon-to-be-released new model is rumoured to have design features including facial recognition and wireless charging technology. Thanks to R&D, the prospect of driverless cars hitting highways across the world is no longer an idea consigned to sci-fi movies. Each of the car-makers featured in PWC’s top 20 R&D list for 2015 harbours ambitions to develop fully autonomous cars. Business Insider estimates that by 2020, 10 million self-driving cars will be on the road. For that to happen, there will need to be substantial investment in R&D. While the development of driverless-car technology has captured the public’s imagination, there are no doubt countless other long-term initiatives that are being kept under wraps for now. However, what is clear is that the amount of investment put aside by big businesses will inevitably increase as R&D continues to reap rewards.